This article suggests ways to integrate art education with environmental education to improve ecological literacy in teachers and students. Oak trees, spiral pathways, landfills and clean sidewalks may seem unconnected, but all have a place in the growing field of environmental art, or Eco-Art. Eco-artists explore relationships between humans and their built and natural environments, and many offer strategies for effecting positive change in these relationships. Their ideas are manifested in the traditional art forms of drawing, painting and sculpture, but also as photography, video, installation art, performance art and landscape design. Eco-Art has existed for decades, but it has only recently infiltrated the classroom, inspiring teachers and students to use art to investigate scientific and ecological concepts along with artistic ones. As an innovative integration of art education and environmental studies, Eco-Art education enhances the power of each domain while supporting their shared goal of helping students better understand the world around them. For example, art education’s typical focus on self-exploration is expanded by having students explore the roles of natural and built environments in our development as individuals and our survival as a species. And the learning strategies of the arts add a subjective dimension to environmental education that enhances both intellectual and affective learning about environmental issues. How do you design an Eco-Art education program for your own classroom? Generalist elementary teachers may find it easier to achieve if they are already teaching and integrating art, science, outdoor education, environmental education, geography and language arts: skills and knowledge from all of these disciplines are required. Secondary teachers focusing on one discipline may need to collaborate with fellow teachers. At either level, having a few strategies will get you started on the path. This article maps recent developments in Eco-Art and aims to inspire teachers to find their own routes into the Eco-Art terrain with their students. While Eco-Art education is relatively recent, art that is centred on environmental issues has been creating trailheads for over three decades. Tracing the paths of eco-artists is a fascinating and inspiring way to begin any art lesson, much like reading an engaging story to inspire students’ writing. Earthworks from the 1970s, such as Robert Smithson’s Spiral Jetty, laid the groundwork for environmental art and inspired many to join the Eco-Art movement. Smithson’s gigantic vortex, created in gravel and dirt on an industrial site at the edge of the Great Salt Lake in Utah, spoke eloquently of the ancient human need to reflect images of nature as a way to express our bond with the natural world. Spiral Jetty evokes memories of snail shells, whirlpools and fiddleheads, and has spurred many viewers to explore their own relationship with nature. And by taking art out of the museum and into a natural setting that had been damaged by industry, Smithson demonstrated the potential for reclaiming industrial wasteland for aesthetic and conceptual purposes. A decade later, German artist Joseph Beuys took this idea further with his 7000 Oaks Project, a collaborative endeavour in which the citizens of Kassel, Germany, planted thousands of oak trees around their community. Beuys wanted others to realize that interactions with the environment can be considered a form of creativity and a means of changing the world for the better. His belief that each human is an artist is a powerful validation for students and teachers, opening the door for all of us to use art as an agent for social change. Since his death, Beuys’ artistic tree-planting project has spread to communities worldwide. More recently, Mierle Laderman-Ukeles, the first artist-in-residence of the New York City Sanitation Department, has been drawing attention to consumerism and waste disposal. Her performances and installations, which include publicly shaking hands with thousands of sanitation workers, washing city sidewalks, and transforming landfills into public parks, stretch viewers’ definitions of art while simultaneously introducing them to environmental issues. Like Beuys, Laderman-Ukeles draws attention to the impact that everyday actions can have on the world around us. By defining these actions as art, she emphasizes their importance and forces us to consider the ramification of something as commonplace as throwing out the trash. Taking the concept of cleaning up even more seriously is American artist Mel Chin, whose work is a unique combination of science and art. His Revival Field in the early 1990s involved planting a contaminated site at a Minnesota landfill with “hyperaccumulators,” plants that are very efficient at taking up heavy metals from the soil. Created in partnership with an agronomist, Revival Field was the first trial of the technique of phytoremediation in which plants detoxify the soil and are then harvested so that the heavy metals they have accumulated can be extracted and recycled. As an artist, Chin was able to experiment creatively and break new ground in both art and science. British artist Andy Goldsworthy inspires many to work in environment-friendly ways by using natural materials (ice, sand, twigs, leaves, stones) to create stunningly beautiful ephemeral artworks that are left on site to return to their natural state. His works exemplify the power of collaboration between humans and nature while subtly reminding us of the need for more sustainable approaches to our daily interactions with nature. Even the most talented artists find it difficult to create work on issues that are not relevant to them. Similarly, young artists work best when they are imaging what they know and care about. Once students have had an introduction to how art can communicate environmental issues, let them identify concerns of greatest interest to them and use these as the starting points for their art. Encourage them to focus their explorations on their own local environment, and expand their definition of environment to include both the natural and the built environment. Whether it is a local park or an historic building, using local settings as the inspiration for their art can nurture in students a strong sense of connection with the place they live. Most important, allow adequate time for artistic reflection; art takes time, as does any form of meaning-making. Art sharpens our power of observation, and how better to develop this faculty than by focusing on the environment? Whether it is observing signs in nature (e.g., drawing the contours of a budding branch or photographing fall colours) or the tracing details of the built environment (e.g., replicating the outlines of a heritage building in clay), many artistic processes force artists (and viewers) to engage all of their senses in experiencing a place fully. In the state of heightened perception that is required to look carefully, attention is focused, information is being processed, and learning is taking place. Having students look for the signs and details in an environment prepares them to connect more closely with it, and such connections are the foundation upon which environmental stewardship is fostered. With these general directions in mind, encourage your students to make their own Eco-artworks and to express their learning about the environment in creative ways. Keep in mind that in Eco-Art education, answers aren’t black or white, right or wrong (one of the joys of arts learning) but instead myriad shades of green, each expressing its own interpretation of and approach to environmental issues. Students, like Beuys’ oak trees, will flourish in this fertile environment, integrating learning from science, geography, language arts, history and outdoor education, and putting down creative roots that may well grow into creative solutions to our environmental challenges. Hilary Inwood teaches in the Teacher Education program at the Ontario Institute for Studies in Education at the University of Toronto. 1 John Beardsley, Earthworks and Beyond: Contemporary Art in the Landscape (New York: Abbeville Press, 1998), ISBN 0789202964. 2 Barbara Matilsky, Fragile Ecologies: Contemporary Artists’ Interpretations and Solutions. (New York: Rizzoli, 1992), ISBN 0847815927. 3 David Bourdon, Designing the Earth: The Human Impulse to Shape Nature. (New York: Harry N. Abrams, Inc., 1995), ISBN 0810932245. 4 J. Ulbright, “Changing Concepts of Environmental Art Education: Toward a Broader Definition,” Art Education (November 1998), pp. 22-24, 33-34. 5 Susan Holmes, “Creative by Nature: Integrating the Arts into Environmental Science Education,” Green Teacher 69 (Fall 2002), pp. 23-28. 7 Laurie Carlson, Ecoart! Earth-Friendly Art and Craft Experiences for 3- to 9-Year-Olds (Charlotte, VT: Williamson Publishing, 1992), ISBN 0913589683. 8 MaryAnn Kohl and Cindy Gainer, Good Earth Ar : Environmental Art for Kids (Manhattan Beach, CA: Bright Ring Publishing, 1991), ISBN 0935607013. 9 Gwen Diehn and Terry Krautwurst, Nature Crafts for Kids (New York: Sterling Publications, 1997), ISBN 0806983736. 10 Bobbe Needham, Ecology Crafts for Kids: 50 Great Ways to Make Friends With Planet Earth (New York: Sterling Publications, 1999), ISBN 0806920246. Beardsley, John. Earthworks and Beyond: Contemporary Art in the Landscape. New York: Abbeville Press, 1998, ISBN 0789202964. Carlson, Laurie. Ecoart! : Earth-Friendly Art and Craft Experiences for 3- to 9-Year-Olds. Charlotte, VT: Williamson Publishing Company, 1992, ISBN 0913589683. Spaid, Sue. Ecoventions. Cincinnati, OH: Contemporary Arts Center, 2002. Kohl, MaryAnn and Cindy Gainer. 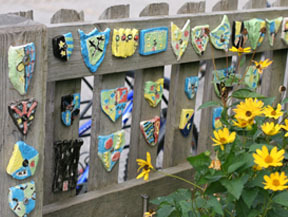 Good Earth Art: Environmental Art for Kids. Manhattan Beach, CA: Bright Ring Publishing, 1991, ISBN 0935607013. Eco-Art principles were the focus of “Sightseeing: Mapping the Visual Arts,” a 2002 summer institute attended by 40 elementary teachers in the Toronto District School Board. A variety of sensory experiences fuelled the teachers’ imaginations as they experimented with eco-friendly art techniques in painting, drawing, clay sculpting and papermaking. The week was filled with talks about eco-art, environmental issues and teaching strategies, and culminated in the creation of “Sense of place” maps -- a fascinating collection of artworks, from paintings and drawings to innovative 3-D installations, which traced the teachers’ creative journeys and personal interpretations of place. Nature installations: Create large-scale sculptures in nature using only materials found on the site. Leave the sculptures in place to slowly decompose. Preserve them only in photographs. Rain paintings: On a rainy day, take painting paper and powdered paints outside. Use spoons or brushes to arrange the paints in desired shapes on the paper and let the rain mix the colours. Bring the rain paintings inside to dry. Natural impressions: Roll out clay and cut it into small squares, circles or triangles. Press natural objects (e.g., shells, twigs, flowers and leaves) into the clay and a make small hole on one side of each piece for hanging. Fire in a kiln or let air dry; then glaze or paint. Stone paintings: Use a small smooth stone as a surface for a painting or drawing. Paint a picture of a special natural place or turn the stone into a small animal by adding fabric ears and tail. Inscribe a memorable word on the stone and return it to its original site for others to find. Bubble paintings: In a small container, mix tempera paint with dish soap. Use a straw to blow air into the mixture. Press paper onto the bubbles to capture their image. Ice sculptures: Create nature-friendly sculptures out of ice. Fill old margarine tubs, buckets and other containers with water that is coloured with food dye. Leave the containers outside overnight in the winter. Pop the ice blocks out of the containers and use them as building blocks. Papermaking: Make environment-friendly pulp using waste paper. Use the pulp for handmade paper or paper sculptures. Papier-mâché: Use discarded containers as the base of papier-mâché sculptures. Tape crumpled newspaper to the containers to make features. Make a paste of flour and water, and apply strips of pasted newspapers to the sculpture. When it is dry, paint or draw details. Junk art sculptures: Create junk art sculptures using the contents of a blue box and lots of glue. Form materials into figures, animals, mobiles or dioramas. This website is 100% wind powered.